In Oregon, 383,000 individuals still go without health care coverage. This reality not only impacts the well being, stability and ability to thrive of Oregon families, it also threatens the economic future of Oregon. Communities of color, LGBT communities, rural Oregonians, immigrant communities, women and low-income families disproportionately experience lack of health insurance and barriers to accessing care. For instance, 17,600 undocumented children are categorically barred from accessing Oregon Healthy Kids, the Medicaid plan for children in low-income families. Additionally, there are significant barriers for women and transgender people when seeking reproductive health care including contraception and abortion services. While 1 in 3 Oregonian women will have an abortion by the time they reach 45, the out of pocket costs for these services remain prohibitive for many. Almost half of all pregnancies in Oregon are unplanned and research shows that those who are forced to carry an unplanned pregnancy to term are three times more likely to fall into poverty within 2 years. These are just some of challenges facing Oregonians, and many communities around the country when accessing health care. In early summer 2015, leaders and community members in organizations in Oregon working at the intersections of reproductive justice, immigrant justice and racial justice conceived of a unified policy agenda that would make their organizing stronger and ultimately lead to building more power for communities across Oregon. Their work is focused on culture change and policy advocacy around multiple issues related to barriers to health care and health access experienced by communities of color, immigrant communities and LGBTQ communities as well as questions of access and affordability related to the full range of reproductive health services for women and transgender individuals. 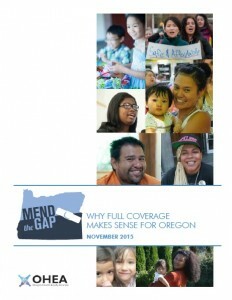 The launch of the unified policy agenda has been spearheaded by the creation of Mend the Gap: Why Full Coverage Makes Sense for Oregon, a report that will be used to both win the support of decision makers and galvanize communities to organize around this agenda. 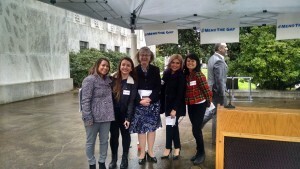 representatives from Western States Center, the Asian Pacific American Network of Oregon (APANO), the Oregon Latino Health Coalition (OHLC), NARAL Pro-Choice Oregon, Oregon Foundation for Reproductive Health and Oregon Center for Public Policy. DataCenter was proud to participate in the launch of the report and the unified policy agenda at the capitol building in Salem on November 17, 2015. For more information, please visit the Oregon Health Equity Alliance website.